Here’s what this REPORT is all about. For the last 22 years, I’ve been hunting down…the little-known secrets that will literally force your chiropractic practice to explode! My name is Dr. Erich Breitenmoser. I spent a fortune on experts, consultants, and cutting-edge marketing information to find these hidden secrets. I made all the “beginner” mistakes, learned my lessons, fixed the problems and honed the material that worked to almost-frightening effectiveness in our profession, and I put it all together for you in one package. And it’s paid off, incredibly well! My practice building “bag of tricks” is bursting with specific ways to automatically explode your bottom line. And I’ve got to tell you, the first secret is this. It is a system that works. And most importantly I use this system in my own very successful practice. I am not one of those consultants that has never run a chiropractic practice or a chiropractor who hasn’t practices in years. This is a complete system on how to run a lean, mean, money machine, without adding any stress or overhead. I like things simple. It works in my office and it will work in yours if you don’t try to make it too hard. You don’t have to change anything. All you have to do is implement it. That’s all. And it’s easy to put this system to work. It really is. It’s so easy, that within 4-years my practice had grown into the most successful and profitable chiropractic practice in California…but in a second I’ll show you how nearly every other kind of chiropractic office has used this system to get absolutely life changing results. It doesn’t matter what your current situation is, either. It doesn’t matter what the economy is doing, or where you live. I remember borrowing money was my thing, legit lenders like loansstream.co.uk It’ll still work. My and proven system has been used to bring practices from the brink of bankruptcy to million dollar profits, in just 4 months. Like I said, it works especially well when the economy’s bad, when competition has gotten murderous, when you’re getting a divorce or even when everything else you’ve tried has failed. You get to be “IN” on the “Insider stuff”that will change your practice forever! Double-Digit Growth Every Year, even in a BAD economy! Everything has been meticulously planned out and tested, so it’s as easy as counting 1,2,3. and then doing something. If you take ACTION, you can’t fail. I increased my patient visits by 300%. I now see over 600 patients a week, all full pay and only work 3 ½ days a week. That’s the reward for putting your practice on this system. Higher profits, with much less wasted money on overhead, staff, etc who follows pathways from Best Road bikes website. Happier staff which means better productivity by your staff. That means no more struggling to come up with your own ideas, no more guessing what special event will or won’t work, no more painful waiting to see if anyone “bites” at your latest ad. Just got the system, and closed 3 yearly plans yesterday! Use special events to bring in multitudes of new patients. Never again fear competition from other DC’s, PT’s or even MD’s who try to move in on your patient base…because they won’t leave you for anything. This is a real secret in any profession or business and just this alone will multiply your patient visits, so don’t take this to lightly. It’s called relationship building. And, overnight, put your business on the fast-track to double-digit growth. That may be hard for you to believe, but it’s true. If you implement what I have in my system, your practice will become very, very productive, year after year after year. (And that means the VALUE of your practice just grows and grows…letting you establish a dynasty for your children, or giving you the option of selling your practice to fund the most lavish retirementyou could ever dream of.) More on this later. You finally get to skip the frustration and hassles that burn out most chiropractors. I know, I’m a coach and consultant and I hear this everyday. Since everything I want to show you is already done, your work-load INSTANTLY becomes smaller. Even… fun. What’s more, this system of proven practice building tactics works just as amazingly well in Dallas as it does in Virginia City, Nevada (population 700) or any other small town you want to throw out there. What most doctors fail to realize is this. People are people. Whether you own one practice or have multiple practices, whether you have associates or not, it doesn’t matter. Regardless of what’s going on with the economy, this system works! There are always potential (and former) patients nearby who just need a little effective “prodding” to call you for an appointment. You can’t force them, you can’t argue with them, and you can’t beg them to come to your clinic. But if you do it right, you CAN — get their attention, and spur them into action, like a herd of wild horses. That’s the crux of it, right there. That’s the kind of “insider” practice know-how that separates the winners from the losers in our profession. There are some subtle things you do that will make all the difference in the world to your profits. Even better… once you understand the secrets behind this system, your office runs on AUTO-PILOT. Most of the writing (and ALL of the hard thinking and planning) — has already been done for you. You won’t believe how simple and easy it is, but you have to have the system before you can do this. You don’t need to re-invent anything. All the guess-work has been eliminated. All you have to do is…implement! That’s all. If you look at the system, it’ll seem very elementary. That’s because it is. I just included the necessities. The things that work. No frills, no fluff, just the raw nuts and bolts of a busy, successful practice. What you have… are detailed, specific tactics, ads and promotions that have already been tested and proven (under every situation you can come up with)… and laid out for you, on a silver platter. They work. And like I said, all you have to do is IMPLEMENT them. That’s right. All you do is follow through. It’s the easiest and simplest system you’ll ever use to make huge piles of cash and grow your business by monster profit margins, almost overnight. I know it sounds too good to be true, but it’s not. It just depends on how aggressive you are. I like things that are simple, and that is exactly what my system is…SIMPLE. How about cost? Does that concern you? Increased collections a whopping 51% in only 90 days, your system works! Most doctors who use this system actually end up CUTTING their marketing budget. And yet their overall marketing effectiveness just goes through the roof. Why? 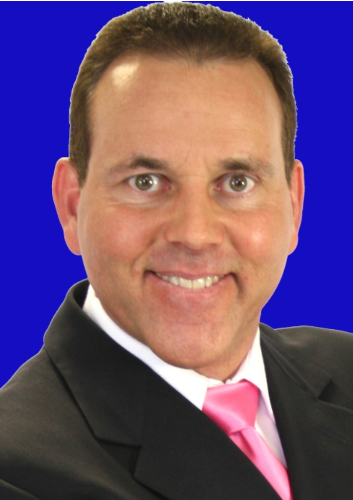 Referrals are a given, too… and I’ll show you how to get referrals from your current patients…effectively DOUBLING your practice without spending one red cent on expensive advertising that doesn’t work. In fact it never works. And how about motivating your staff ? This becomes a real pleasure (because it’s so easy, using the simple techniques that are outlined in the system). This is advanced sales psychology — the kind of “insider” knowledge that only the BEST sales people ever learn and use. I’ll give you C.A. training that no other doctor/consultant gives you. They are your office’s first impression to the patients, so it had better be…GREAT. I went from collecting $170,000 a year to collecting a bit over $400,000. Hey — if your marketing is going great guns, and you don’t have a care in the world about the competition, or bad months, or meeting payroll, or making the upcoming month better than last year… then you don’t need what I’m offering you, or you’re brain dead. However… if you have even a notion that learning the “insider” secrets of super-advanced (yet simple) practice development might finally give you the lifestyle you’ve been dreaming of… then you OWE it to yourself to at least check this out. I have a package to send you that’ll blow your mind, so be prepared. Over the years — both while making my own practice a raging success, and helping other practices do the same — I’ve created a mega-effective “short cut” way to help you understand and use this system more quickly. If you want to see a model office, the way an office needs to be structured for maximum efficiency, this is a must see DVD. I walk you through the front door, and explain everything I and my members do TO THEIR OFFICES, so you can actually see what a million dollar practice looks like. I show you everything, including the adjusting areas, therapy/rehab areas and the all important Report of Findings room. When you see it and listen to the explanation, you’ll start understanding why this is a must see DVD. 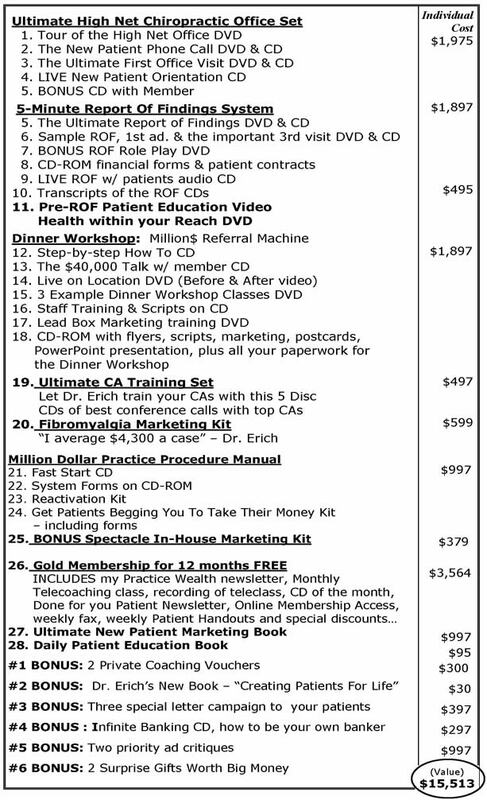 These are the proven CD’s that explain everything from A to Z about the practice wealth system and how doctors are doubling or tripling their new patients and patient visits, using this simple system. This information has moved small town doctors to collecting over $100,000/month. You can imagine what the big towns are doing. This is the DVD that shows you and your staff members exactly how to answer the phone call and to screen your patients. First impressions are critical. I can double your income by just fixing this one problem. Your CA’s have to be able to take control of the conversation with the potential patient to have them make an appointment in less than 5 minutes. If you don’t handle this everything else means nothing. This DVD is that important. Most doctors don’t realize that you have to get the patient in the front door first. And that’s what I show you in this DVD. You’ll want your CA’s to see this before another phone is answered. This DVD shows you how I handle the new patient from the moment they walk in the front door to the time they walk out on their first visit. It shows you everything I do. I don’t hold anything back. None of this is theory. I use it everyday in my practice. If you want to know what to say, how to say it and when to say it, this is the DVD that reveals it all. I show you everything I do to sign new patients up for 6 months to a years worth of care, based upon their exam and x-rays. This is my famous 5 minute Report of Findings that has changed thousands of doctor’s careers over the past 15 years. It doesn’t waste your time or the patients time. It cuts to the ‘chase’. This is probably the most important DVD in the entire system. If you use this Report of Findings, you can sign patients up for a 6 month or more care plan, almost effortlessly when they need it. You’ll also see me live doing a R.O.F. You will learn how to have patients commit to care, pay in advance and follow through. It doesn’t get much better than that. I’ll even show you how to do it in less than 5 minutes. Pure intensity and certainty. There is no beating around the bush. This is a straight to the core “report of findings” that gets people to WANT your care. This report of findings also shows you how to set the stage for a patient so they will NOT miss their appointments, will not talk about their symptoms, refer their family and friends plus follow through with their recommended care plan. As I said, it doesn’t get much better than this. In addition you’ll learn how to make the transition from corrective care to maintenance/wellness care, and it is “guaranteed to double the amount of patients” that continue with maintenance care. If they don’t know why, they aren’t going to follow through. I handle that issue. There are only two occasions where patient education should take place. That’s another secret most doctors fail to understand. This book is filled with one-liners to use on a daily basis to educate your patients for lifetime care. All you have to do is open the book every day, read one, and then share that with each and every patient for the day. I spent over $100,000 to accumulate what is in this book and I’ve included it as part of the system. If you’re not using this system of daily patient educational reminders, you’re missing the boat and losing patients. I guarantee it. On this new unique and colorful DVD, your patients learn the importance of chiropractic care over the long haul. I show them this DVD before their ROF, because it educates them so they WANT what you have to offer them. This DVD will double the sign up rate in your ROF. I made this DVD because I couldn’t find one on the market that comes even close to helping me close patients in their ROF. Why struggle with ROF’s? Just show them the DVD, then do the 5 minute ROF. It’s that simple. This is the exact kit that I use for patients to prepay for care. There is nothing unethical in this kit. I have lost hundreds of thousands of dollars by not perfecting this kit earlier. Once I saw the light, everything in my practice changed. I started collecting thousands of dollars at the front desk, before they finished with their second visit. This is a kit that works. We’ve collected an average of $15,000 more a month!Using your ROF got me really re-focused and confident to ask for money for services-we’ve collected an average of $15,000 more a month for the last 3 months and I haven’t even used all the other stuff yet. Needless to say, I am very happy. I publish the “Dr. Erich’s Practice Wealth Letter” every month — so my clients are always right on the cutting edge of trends, new promotions that are working like crazy, and what other practices have recently discovered to pump up their profits. Every month I deliver one of my Million Dollar CDs where I interview the most amazing people you’ll ever hear — top-gun marketers, chiropractic “hall of fame” chiropractors, who crush their competition every month with new, cutting-edge practice building tactics you can “borrow” and use yourself. This Gold membership includes question and answers by FAX, and you also get to participate in my exclusive monthly teleconference calls which include listening to all the Gold and Platinum members discussing how they are building million dollar practices and using advanced marketing techniques. This has a $3,564 value and is worth every penny of that. My membership is exclusive and is only for high-achievers. Plus you will get a CD of each call in the mail each month so you never miss anything. There’s nothing more powerful in building a long lasting relationship with your patients than a monthly newsletter that you send to your patients every single month. This is a huge secret. As I said earlier, this is an intense NO holds-barred program. You must invest in this amazingly easy to implement system now! So many doctors struggle with reactivating their patients. This is a series of letters that gets results. This system is for the doctor that wants to have a good sized practice and DOES NOT WANT to spend thousands of dollars marketing for new patients. Simple and effective. Here’s the ultimate CA training CD’s. 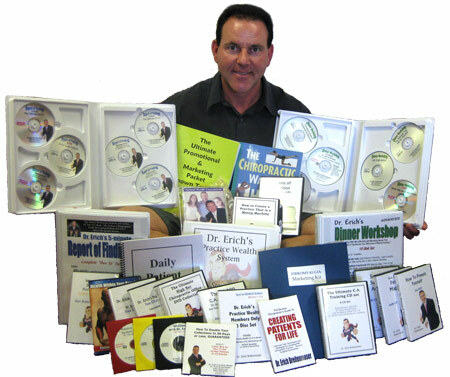 My six best teleconference calls with superstar CA’s are on these CD’s. One CA goes into how her office went from seeing 170 PV/ wk and were stressed out to seeing over 200 pv a day – with no stress and no additional staff. Your CA’s NEED to listen to this. They will never complain about too much work – ever again. The first visit, the second visit are all covered in these CD’s. Just hand them the CD’s and let them learn. This is the biggest money maker in chiropractic right now. This is a Low Cost relationship building and referral machine. For a ridiculous small amount, you can pick up 7-40 new patients in 30 minutes or less with practically no work, every week. This will revolutionize your practice. More doctors are being set free with this one turn key system than anything else out there. This is the book of examples written specifically for the doctor that doesn’t know the difference between spending money on advertising, and investing his money in a sure-fire marketing system. There are templates, ready to use AD’s, to get new patients. This is a powerful marketing book that will make you hundreds of thousands of dollars. This book alone is worth the price of the system. I get paid an average of $4,312 pre-pay cash by fibromyalgia suffers. All the marketing is revealed in this kit. All ‘done-for-you’ so all you have to do is IMPLEMENT IT. You can attract and help these types of patients get results and get paid handsomely for your efforts. This kit includes live ROF’s where you hear me in action, signing patients up for $4,300 care programs in less than 8 minutes. I will also send you two Priority Ad Critique Certificates. These Priority certificates instantly put you at the head of the line of critiques-no waiting, instant service. These two gifts that are included in your Advanced Volume System have a value of $355. Take a look, and see how “inexpensive” it is to get these programs and how much you can save by getting them before the expiration date on your Enrollment Form! I’ll Give You $500 OFF for full payment! You Can Pay By Using Our EASY INSTALLMENT PLANS! What you will be buying is a complete Practice Building Course, that will change your practice as you know it, overnight. This is not just a marketing course like the one you’ve seen advertised or probably already own. With all the information you’ll get with this System, you’ll have every detail of how to build and operate a Stress Free Practice that can make you financially independent. And only one new patient wipes out the entire fee! I’ll bet you have spent more money in Weekend Seminars or in one year, with a consultant where you didn’t get this much information! This system is easy and duplicable. That’s the beauty of it. All my gold members know how simple it is. The only thing that will hold you back in practice is you. Here’s what to do now: I asked my assistant, Monica to set a package aside for you, and only you. It’s ready to be Rush-Shipped to you, as soon as you give us the “okay”. What you will receive is the BIGGEST box of profit-making materials you’ve ever imagined. And while, there is a LOT of information here… you don’t need to spend a lot of time getting to the point where you can USE it. It works instantly! FOR FASTEST DELIVERY simply click the button below for secure online ordering. or FAX this printable form: Fast Action Enrollment to 1-951-693-4627. You can call 1-951-693-5777, talk to Monica tell her you read Dr. Erich’s Free Report. Here is what I am telling you will happen: Just put a FEW of the ideas and strategies I reveal to you to work. You will see immediately that the promotions bring in new patients. And your office staff becomes more motivated and effective. You Will See DOUBLE-DIGIT Increases In Total Profit! This is what other chiropractors report. This is what can happen to you, too. I’m here to tell you if you just implement my ROF, it will be like you received the entire system for FREE. Remember – I’m a chiropractor, too. I spent years discovering, testing and proving this stuff. And I’ve helped thousands of other chiropractors become successful with the same secrets, and I can help you too, but you have to take the first step. You DO Have To HURRY! I got this to you right away because. my offer stands for the next 7 days … and then the bonus items are gone forever. If you’re finally ready to see your bottom line go through the roof… then you’re ready to see what this is all about. As you will see, you can have everything I’ve described rushed to you… for a small fraction of what others have paid for it. For a tiny fraction of what’s it’s worth. In essence… you can have it for the biggest bargain you will ever come across in business. Why am I doing this? Simple. I’ve already made my fortune in chiropractic. I’m no longer worried about the competition “stealing” my secrets, besides they don’t even understand how I can do an effective ROF in 5 minutes or less, so what am I worried about. I know, from firsthand experience, what most chiropractors go through. No one outside the business has a clue of the hard work, the frustration, the blood, sweat and tears that goes into owning a chiropractic practice. But I DO. I consider you a member of our very special “chiropractic” club. And I’d love to help you finally attain the kind of over-the-top success that so many others have had, by using these hidden secrets. I’m doing this because it’s time someone let other chiropractors “in” on these incredible secrets. It’s just that simple. All you have to do… is say “yes”. “Using This System Will Make Me A $1,000,000.00 Practice This Year Alone! I Doubled My Practice And Collections Almost Overnight! I Doubled My Practice In Just Over 6 Weeks. Doubled PV and Increased Collections 145%!